The Piano Lab offers group piano instruction to those who otherwise could not afford private instruction. The mission of the Piano Laboratory at First Lutheran Church is to offer group piano lessons to students who would not otherwise be able to afford private piano instruction. The Lab is equipped with eight Roland keyboards with touch-sensitive weighted keys (simulating the action of the modern grand piano), a teaching station, and a large flat-screen television. 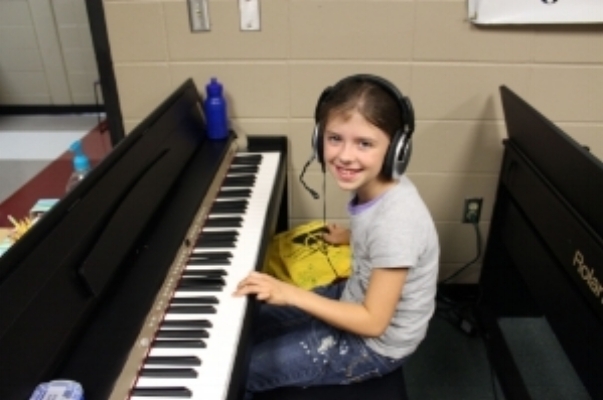 The studio can accommodate up to eight students at a time for group piano lessons. The Piano Lab curriculum is designed to take students from pre-music reading to fluency in both bass and treble clefs. Classes for the 2018-19 school year have begun. For more information, please contact Shirley Barlow.